“Hello Atlantic City!” Ten thousand fists punch the air as one. Even in $250 seats you can’t quite make out Madonna’s face, only the canyoned tendons of her mighty thighs. Like the show itself, they are both spectacular and grimly efficient. But I am not here in the Boardwalk Hall just to see the 50-year-old Queen of Pop. 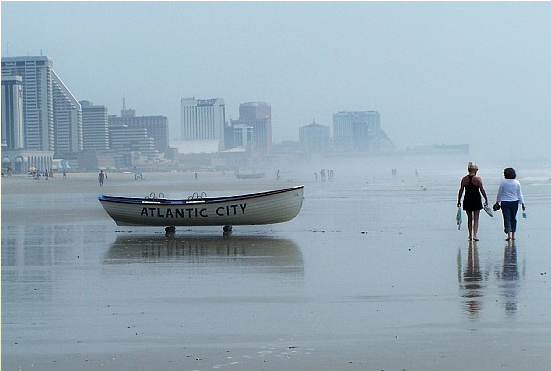 I want to discover how another old girl updates her image: Atlantic City itself. It tends nowadays to be dismissed as the poor cousin of Las Vegas. Yet it’s only a couple of hours from New York, where gambling is illegal, to this seaside casino town. Billions have recently been spent on redevelopment and – credit crunch permitting – billions more are promised, including a new express train service launching on Feb 6. Unlike Vegas, the place has a rich history. Long before gambling was legalised in 1978, its luxury hotels were the stuff of legend. You’d see “Diamond Jim” Brady stepping out with Lillian Russell along the world’s first and longest boardwalk, jostled by a carnival of hucksters, freaks and escapologists. Atlantic City’s streets gave their names to the original version of Monopoly. Most celebrated of all, until the animal rights movement gained ground, were the diving horses of the Steel Pier. Three times a day, a girl in a bathing suit would ride right off a rickety wooden ramp into a tank of water 60 feet below. The force of one dive detached her retinas, but you don’t let a little thing like that stop you in Atlantic City. She continued the stunt, blind, for another ten years. After the war, with the spread of air conditioning and suburban swimming pools, the visitors stopped coming. The rich holidayed in Vegas, or flew to Miami. Atlantic City became a decaying, slum-ridden place, largely abandoned even by the Mafia for whom it had been a Prohibition playground. Enter the casino boom of the last three decades. Even so, and despite a proportion of the profits being ploughed back into the community, Atlantic City has never quite caught up to Vegas. The lovely Boardwalk, still four miles long, is lined with tacky T-shirt shops and massage parlours, and many buildings are still boarded up. Yet there is a new sense of optimism. Steve Wynne, the casino mogul who invented modern Vegas 20 years ago with the Mirage, opened the gleaming-gold Borgata here in 2003 (a snip at $1.1 billion). Last summer he added The Water Club, an 800-room tower with four pools. At Harrah’s next door, the whole building turns into a spectacular light show by night, best witnessed from inside the tropical pool under a geodesic dome. The once eye-poppingly tacky Trump Taj Mahal has had a tasteful $100 million makeover, and added the $255 million Chairman Tower. Caesar’s has converted one of the old piers into a covered arcade of shops and restaurants stretching out over the waves. Outside the casinos, too, things are changing. The newly refurbished Chelsea Hotel proves to be in exquisite taste, more like a trendy Hoxton private members’ club than a hotel. Its retro décor harks back to the city’s jazz-age past, but the saltwater spa, cosy fireside lounges and poolside cabanas cater to contemporary tastes. Add to that an ocean view as limitless as Vegas’s desert, and this is, to my surprise, one of the nicest hotels I’ve ever stayed in. Atlantic City’s best fine dining restaurant is just round the corner. Again, the Knife and Fork is a canny mix of old and new that makes a welcome change from Vegas’s mix of, er, new and new. A one-time Prohibition-era Speakeasy that had every bottle in the bar broken in a police raid, it now boasts a 10,000-bottle wine cellar. The building is a sprawling old Flemish pile with pointy eaves, recently given a very sympathetic makeover. Altogether, with its discount fashion outlets, sandy beaches and (in summer) amusement-park pier, there is a sense that you wouldn’t have to gamble to enjoy Atlantic City. But then who am I kidding? That’s why I came. More specifically, I came to play poker. I won $1,100 in a tournament the previous weekend. My aim is to double it this weekend. Ever since the US banned online poker sites in 2006, the demand to play live has gone through the roof. Every major casino now has its own card room. You can play knock-out tournaments, where you pay a fixed entry fee for anything up to five hours’ play, or cash games, where you can lose hundreds in a single hand. I played both kinds. Several times. And, I’m ashamed to say, lost at all of them. First, the Taj, where Matt Damon played in the film Rounders. The poker room is large and functional, with more than 100 tables, but rather tatty. The $100 tournament is disappointingly undersubscribed: just 19 people. The bloke to my right, an Irish plasterer living in New York, is here on a Friday because building work is drying up as the credit crunch bites. He’s a loose player, but I still let him raise me off my pair of eights with his pair of sevens. Bad play, and I don’t improve. I try Bally’s in the evening. The poker room here is smaller, but more modern. It’s on the sixth floor, the huge windows giving a great view of the city lights. There are 57 players this time, and a livelier atmosphere. “Man, you guys are so tight,” says an Asian man as he pushes in all his chips (“tight” meaning “cautious betters”), “I’m going to need me some Vaseline.” I survive for four hours, until I play a pair of eights hard: this time I’m not going to fold them! Whoops. My opponent hits a second Jack and I’m out. The next day, I move on to the Borgata. Wow. Now this is a card room. More tables than the Taj, high ceilings, flat-screen TVs on all the walls, beautiful cocktail waitresses to bring you free drinks while you play. In fact the pulchritude of the “Borgata babes” has become a point of nationwide debate: last summer the casino settled a sexism lawsuit brought by two former waitresses, fired for breaching their contract that they gain no more than 7% of their body weight. Perhaps they distract me from my game. Or perhaps I really do have the outrageously bad luck that I think I’ve had. Whichever, far from doubling the $1,100 I came to gamble, I lose the lot. Ah well. If I thought a trip to Atlantic City was a solution to my credit-crunch problems – that I could gamble my way into a fortune – then I, like millions before me, was sadly mistaken. But as an introduction to the attractions of an unfairly maligned city, a long weekend in Atlantic City does just fine.